KIEV, Ukraine -- Ukrainians have chosen a Crimean Tatar singer and her song about the mass deportation of Tatars under Josef Stalin as the country's entry for this year's Eurovision song contest. Jamala will represent Ukraine at Eurovision. 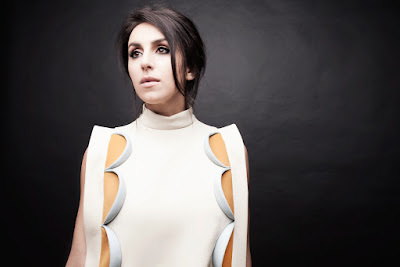 Susana Jamaladinova, who performs under the stage name Jamala, was chosen Sunday night by the combined votes of a three-person jury and some 380,000 votes from viewers watching the televised final round. Her song "1944" refers to the year in which Stalin uprooted Tatars from their homeland and shipped them in badly overcrowded trains to Central Asia; thousands died during the journey or starved to death on the barren steppes after they arrived. They were not allowed to return to Crimea until the 1980s; Jamaladinova was born in Kyrgyzstan. The song is a peculiar combination of a mid-tempo pop confection and anguished lyrics. "When strangers are coming, they come to your house, they kill you all and say 'We're not guilty'," the song begins. "That terrible year changed forever the life of one fragile woman, my great-grandmother Nazylkhan. Her life was never the same," Jamaladinova told The Associated Press before the Sunday broadcast. The song lyrics do not touch on Russia's annexation of Crimea two years ago, but entering the singer in the hugely popular song contest could raise the issue by implication. Crimean Tatars, who are a Turkic and mostly Muslim ethnic group, say oppression against them has increased since Russia annexed the peninsula. "There is no mention there about occupation or other outrages that the occupants are doing in our motherland; nevertheless it touches on the issue of indigenous people who have undergone horrible iniquities," said Mustafa Jamilev, leader of the Crimean Tatars. Eurovision rules prohibit songs with lyrics seen as having political content. In 2009, less than a year after Georgia and Russia fought a brief war, the competition disallowed Georgia's proposed entrant because the group's song lampooned Russian President Vladimir Putin. Ukraine's 2005 entrant Green Jolly was told to rework the lyrics of its song "Razom Nas Bahato," which was an anthem of the previous year's Orange Revolution protests. The Eurovision final round with competitors from around the continent takes place in May in Stockholm.